Human beings have known for quite some time that our behavior has a significant influence on our planet. In fact, during the 20th century, humanity’s impact on the natural environment and climate has become so profound that some geologists began to refer to the modern era as the “Anthropocene”. In this age, human agency is the most deterministic force on the planet. But according to a comprehensive new study by an Anglo-American team of researchers, human beings might be shaping the near-space environment as well. According to the study, radio communications, EM radiation from nuclear testing and other human actions have led to the creation of a barrier around Earth that is shielding it against high-energy space radiation. The study, which was published in the journal Space Science Reviews under the title “Anthropogenic Space Weather“, was conducted by a team of scientists from the US and Imperial College, London. Led by Dr. Tamas Gombosi, a professor at the University of Michigan and the director at the Center for Space Modelling, the team reviewed the impact anthropogenic processes have on Earth’s near-space environment. These processes include VLF and radio-frequency (RF) radio communications, which began in earnest during the 19th century and grew considerably during the 20th century. Things became more intense during the 1960s when the United States and the Soviet Union began conducting high-altitude nuclear tests, which resulted in massive electromagnetic pulses (EMP) in Earth’s atmosphere. The existence of radiation belts (or “toroids”) around Earth has been a well-known fact since the late 1950s. These belts were found to be the result of charged particles coming from the Sun (i.e. “solar wind”) that were captured by and held around Earth by it’s magnetic field. They were named Van Allen Radiation Belts after their discover, the American space scientist James Van Allen. The extent of these belts, their energy distribution and particle makeup has been the subject of multiple space missions since then. Similarly, studies began to be mounted around the same time to discover how human-generated charged particles, which would interact with Earth’s magnetic fields once they reached near-space, could contribute to artificial radiation belts. One thing that the probes have noticed was the interesting way that the outward extent of the VLF bubble corresponds almost exactly to the inner and outer Van Allen radiation belts. What’s more, comparisons between the modern extent of the radiations belts from the Van Allen Probe data shows that the inner boundary is much farther away than it appeared to be during the 1960s (when VLF transmissions were lower). What this could mean is that the VLF bubble we humans have been creating for over a century and half has been removing excess radiation from the near-Earth environment. This could be good news for us, since the effects of charged particles on electronics and human health is well-documented. And during periods of intense space weather – aka. solar flares – the effects can be downright devastating. Given the opportunity for further study, we may find ways to predictably and reliably use VLF transmissions to make the near-Earth environment more human and electronics-friendly. And with companies like SpaceX planning on bringing internet access to the world through broadband internet-providing satellites, and even larger plans for the commercialization of Near-Earth Orbit, anything that can mitigate the risk posed by radiation is welcome. The radiation-heavy Van Allen Belts around Earth contain particles that can move at almost the speed of light across vast distances, new research reveals. The information came from an instrument flown aboard the Van Allen Probes twin NASA spacecraft, which launched in 2012. According to scientists, the process that creates this is similar to what happens in the Large Hadron Collider and other particle accelerators. The magnetic field on the Earth accelerates electrons faster as these particles orbit the planet. While scientists had spotted this process happening at small scales before, the new paper has seen this across hundreds of thousands of kilometers or miles. “With the Van Allen Probes, I like to think there’s no place for these particles to hide because each spacecraft is spinning and ‘glimpses’ the entire sky with its detector ‘eyes’, so we’re essentially getting a 360-degree view in terms of direction, position, energy, and time,” stated Harlan Spence, principal scientist for the Energetic Particle, Composition, and Thermal Plasma (ECT) instrument aboard the probes, and co-author on the research paper. He is also director of the University of New Hampshire Institute for the Study of Earth, Oceans, and Space. The research was led by University of Alberta physicist Ian Mann, and is available in Nature Communications. “People have considered that this acceleration process might be present but we haven’t been able to see it clearly until the Van Allen Probes,” Mann stated. In September of 2012, scientists with the newly launched Van Allen Probes got permission to turn on one of their instruments after only three days in space instead of waiting for weeks, as planned. They wanted to turn on the Relativistic Electron Proton Telescope (REPT) so that its observations would overlap with another mission called SAMPEX (Solar, Anomalous, and Magnetospheric Particle Explorer), that was soon going to de-orbit and re-enter Earth’s atmosphere. Now, they are very glad they did, as something happened that no one had ever seen before. 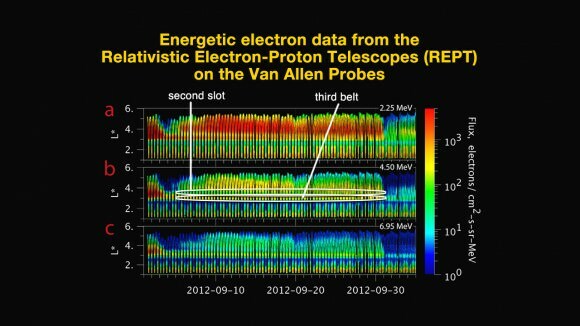 A previously unknown third radiation belt formed in the Van Allen Radiation Belts that encircle Earth. The scientist watched – in disbelief – while their data showed the extra belt forming, then suddenly disappear, like it had been cut away with a knife. They have not yet seen a recurrence of a third belt. What happened is that shortly before REPT was turned on, solar activity on the Sun had sent energy toward Earth that caused the radiation belts to swell. The energetic particles then settled into a new configuration, showing an extra, third belt extending out into space. Since their discovery in 1958, we’ve known that the Van Allen radiation belt is composed of two donut-shaped layers of energetic charged particles around the planet Earth, held in place by its magnetic field. The scientists are now incorporating what they saw into new models of the radiation belts – a region that can sometimes swell dramatically in response to incoming energy from the Sun, impacting satellites and spacecraft or pose potential threats to human space flight. The belts are normally between 200 to 60,000 kilometers above Earth; the new ring was much further out. Launched on August 30, 2012 as the Radiation Belt Storm Probes mission, the twin probes were renamed in honor of the belts’ discoverer, astrophysicist James Van Allen. Observations of the belts have shown they are dynamic and mysterious. However, this type of dynamic three-belt structure was never seen, or even considered, theoretically. The Energetic Particle, Composition, and Thermal Plasma (ECT) suite of instruments on board the probes were designed to help understand how populations of electrons moving at nearly the speed of light and penetrating ions in space form or change in response to variable inputs of energy from the Sun. Already, what the team has learned is re-writing the textbooks of what is known about the Van Allen belts. At a press briefing today, the team was asked why this third ring had never been observed before. The team will be seeking to understand what the third ring mean for astronauts and satellites, even though the new ring is farther out, the regions in Earth orbit are magnetically connected to the new region that formed. “Knowing more about this and understanding more about the belt is important for having better models and being able to predict the lifetimes of spacecraft,” said Fox. The team has published a paper in the journal Science.